Ex-Alpine engineer Claude Poiraud and ex-Peugeot designer Gerard Godfroy collaborated to create a car initially called the M.V.S. Venturi. 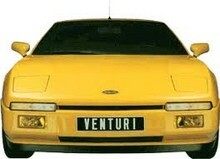 Two years later in 1986, a revised model was shown under the name Venturi and production started in April the following year.